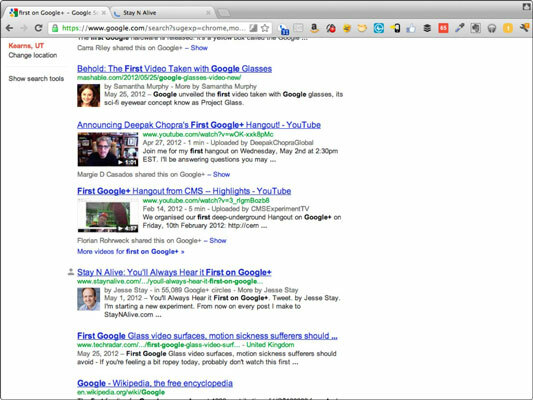 Your Google+ company profile is pretty important for ensuring you rank well in Google.com search results. As with optimizing your website for search you’ll want to optimize your Google+ profile as well. Make sure your page has a name that people will search for. If you want to rank well when people search for chocolate chip cookies, it probably won’t help you to have Mrs. Fields in your title. Make sure your title also has the words chocolate chip cookies in it, preferably toward the start of the title.. Put important keywords at the start of your tagline. Time will tell whether your tagline affects your Google.com search results, but your tagline does affect your Google+ search results. Make sure that critical search terms occur toward the beginning of the tagline for your page or profile. Fill out your employment and education information (for personal profiles). This is important so that when people search for your company name they can find the employees who work there, especially those who are also their friends. If you search for Microsoft, for example, you’re likely to see a list of Google+ profiles belonging to those in your circles who work for Microsoft. Pick a recognizable picture. Your picture is what appears if your website is configured to show authors of articles. Making sure you have a recognizable picture ensures you or your brand is recognized immediately when it appears in search results. The more recognizable your image, the more people’s eyes will be drawn to your search results, regardless of where you rank on the page.